Voice of Reason:::Roger Tan: Democracy or democrazy? Cyber assault: Chua Lai Fatt’s MyKad as posted and circulated on Facebook. Democracy is about accepting finality through the ballot box and due process of law. IN the 2000 United States presidential election, despite Al Gore having won the popular vote, he did not get to become President. He received 266 votes and George W. Bush obtained 271 at the Electoral College due mainly to the vote recount fiasco in the state of Florida. The matter went all the way up to the US Supreme Court, which ruled 5-4 in favour of Bush. This was by far one of the most divisive and controversial US presidential elections, so much so that Bush was described as the President elected by the US Supreme Court. Even though Gore strongly disagreed with the apex court’s decision, he was nevertheless gracious in defeat. Indeed, it took a big man like him to admit defeat. I remembered his concession speech almost moved me to tears. This is what democracy is all about – accepting finality through the ballot box and due process of law. Alas, Datuk Seri Anwar Ibrahim refused to do so. He has vowed to move on with a “fierce movement” by holding protest rallies throughout Malaysia to challenge the 13th general election results. This is not democracy. If I may coin a new word for the Oxford’s English dictionary, it is democrazy! > new ballot boxes were added or exchanged when there was a blackout in Bentong in order to enable Datuk Seri Liow Tiong Lai to win. In fact, all sorts of unfounded allegations and rumours were mendaciously spewed with impunity by anonymous Facebook pages like “We Fully Support PKR” to cause anger and hatred among the electorate. It is really shocking to see how so many Malaysians actually believed in unverified rumours by even sharing them on social media. Many were also thinking irrationally in their arguments over the social media. A small number of them were sadly converted to vigilantes by taking the law into their hands. No wonder one recent study claimed that Facebook could actual­ly send you mad by causing “psychotic episodes and delusions”! This explains why China has banned social media like Facebook and Twitter; otherwise it would have disintegrated long ago! One case that requires special mention is that of Chua Lai Fatt who was harassed by cyberbullies. He is of Indian descent but many people did not know that as an orphan he was adopted by a Chinese family. He actually speaks fluent Hokkien. 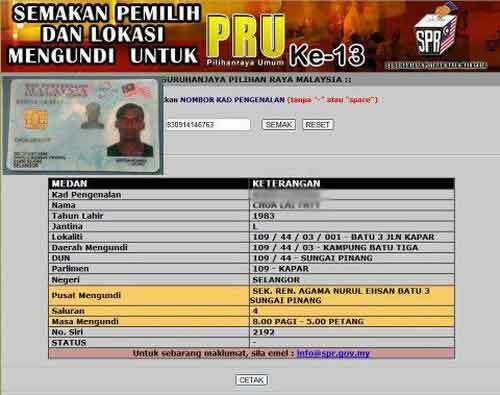 A copy of his MyKad with his picture and Chinese name was posted and circulated on Facebook. It was really distressful to read all those abuses thrown at him until his family and friends came forward to explain. But nothing can be as distasteful as the picture of a mock altar with candles and joss sticks placed before Datuk Seri Najib Tun Razak’s photograph. Also, no error could have been bigger than Anwar’s when he tweeted as early as 6.57pm on May 5 that Pakatan had won when votes in a majority of areas were still being counted! Is this what we call clean and fair elections? Bersih and its leaders should also take the blame by fuelling unverified rumours of tens of thousands of foreign voters. While I cherish my friendship with Datuk Ambiga Sreenevasan, I must still say, personal friendship aside, that this time round Bersih has lost its credibility as a neutral and independent election watchdog. There is no doubt that it has done a marvellous job in raising public awareness about the importance of fair and clean elections. In fact, the high turnout during the election could be attributed to this greater public awareness. But during the campaigning period, it looked as if Bersih’s cause was no longer about fair and clean elections but rather in ensuring victory for Pakatan. It follows that if many still believe Barisan had won due to massive fraud, then it can also be argued in the reverse that Barisan could not have lost so badly if there had been tens of thousands of phantom voters and massive fraud. We must move on. The country needs to move on. We have had enough of all the politicking from the 12th to the 13th general elections. If we want to continue in this way until the 14th general election, it is only the rakyat who will suffer. If there is any evidence of wrongdoing, then they should produce it in the election court. A fortiori, the accusers owe it to Malaysians to provide such evidence in a court of law so that election results can be overturned or fresh elections can be called. But not through street protests any more. In fact, a total of 26 election petitions were filed after the 2008 elections, but none was overturned. It is sad to see that in this most divisive election in our nation’s history, many so-called independent and apolitical NGOs and religious bodies openly took sides. Some were even prepared to burn all the bridges with the Barisan government which they had taken pains to build over the years. But this is the time for national reconciliation. Each one of us plays a part in bringing healing to our divided land. Najib has said he is the Prime Minister for all Malaysians. So, there should be no witch-hunting. Neither should any voter or community be punished for making their decision through the democratic process. The new government must immediately address the issues which matter most to Malaysians, which are corruption and social injustice. At the same time, victors and losers must move on for the sake of national unity and reconciliation. Let us uphold democracy and not embrace democrazy. God bless our beloved Malaysia. Democracy is a form of government in which all eligible citizens have an "equal" say in the decisions that affect their lives. Correct me if I am wrong, but based on the number of votes cast in GE13, am I wrong to say that majority of the Malaysians supports Pakatan Rakyat? Each votes should be treated equally.